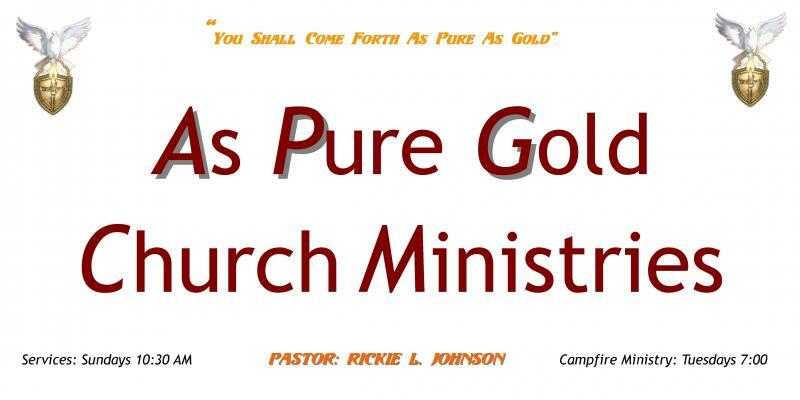 As Pure Gold Church Ministries - Worship Schedule / Calendar Events "Come and Be Blessed"
Pastor R.L. Johnson and APG will be ministering at United Friends Church, Fayetteville, NC, Hwy 210 East, 4:00 p.m.
"God is moving powerfully, healing, delivering, and ministering to his people. "The anointing to destroy the yokes is present at every worship service." "Give notice to your enemy, "you're coming out", to be blessed"
"I'd rather be a doorkeeper in the house of my God than to dwell in the tents of the wicked"
"Come if you can, you won't be dissappointed"
"You shall come forth, as pure as gold"
Copyright 2010 As Pure Gold Church Ministries. All rights reserved.